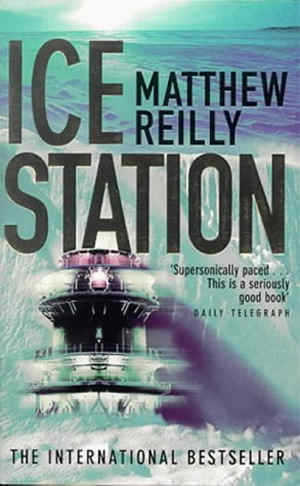 ICE STATION by Australian author Matthew Reilly is more of an out-and-out adventure thriller than a crime/thriller novel, but I still found it pretty enjoyable, if fairly (very) mindless at times. There are few Antartica-set novels on the market, in any genre, which is perhaps a little surprising, in terms of the uniqueness of the location etc, but then again given many novels are really mostly about the people in them, and the relationships between people and the affect people have on each other, I guess it's not that unusual that there are few novels set in Antarctica. Given there are so few people there, and so few reasons for people to be there. This is the third Reilly novel I have read, but the first in several years. He has a fascinating back-story, writing his first novel (CONTEST) while at Law School in Australia, he was roundly rejected by all the publishers, so he self-publised, worked hard selling it basically from 'the back of a car', so to speak, and then it became a hit, he was picked up by a big publisher, and now he's sold truckloads and truckloads of his fast-paced adventure thrillers. ICE STATION certainly lived up to it's billing as a thrill-a-minute page turner. I found myself chuckling at some of the cheesy dialogue, or ridiculously over-the-top situations at times, but overall I was pulled along by Reilly's fastpaced storytelling. It's an ideal 'airport read', or for some relatively mindless escapism on a lazy weekend. To be fair, Reilly does actually bring in some interesting geo-political issues and themes, although they can be lost in amongst the high-octane action, and over-the-top-ness of the rest of the book. But if you look, they're there. For those unfamiliar with Reilly, I'd probably describe his books as a less serious and detailed, and more fun, silly, and flat-out exciting type of Tom Clancy story. And even though many of the characters were a little or a lot cliched, caricatured or cardboard, I did enjoy the way Reilly brought things together, and I did find myself caring about some of them by the end. An enjoyable easy, breezy read that won't stretch you mentally, but is kind of fun.